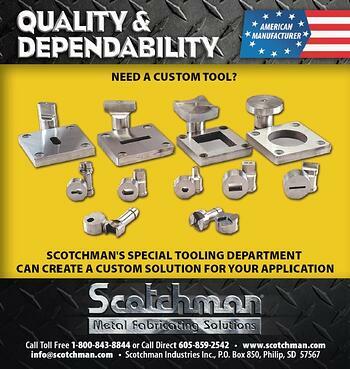 Custom Tooling Requests | Scotchman Industries, Inc.
Are you in need of custom tooling for your Scotchman machine, No problem! Our metal fabricating machines are designed to tackle a wide range of applications & projects, but customers do come up with a more efficient or unique way to use our machine for their specific job. This is where our team of engineers comes in. If you need something beyond the standard tooling we offer, our knowledgeable custom tooling team is equipped and ready to design and build whatever tools, punch & die sets, brakes, shears, V-notchers, etc. ... Basically, whatever you need to get your job done. A description of what you need your custom tool to do. What Scotchman machine will it be used on. A print, drawing, or photo illustrating your needed function.